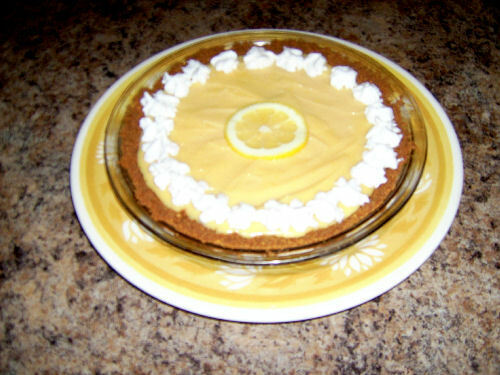 Spring & Summer mean lemon pie! What’s great about this pie is that it’s started on the stove top then placed in the fridge for a few hours. Make it in the morning to enjoy after dinner. Preheat the oven to 350 degrees; Grease a 9-inch pie plate and set aside. In a medium bowl, combine the crumbs, cinnamon and melted butter and stir with a fork until blended. Press this mixture into the bottom and sides of the pie plate. Bake this for 10 minutes. Let it cool completely. In a medium pot, whisk the milk, yolks and lemon juice until smooth. Cook this custard over medium heat until very hot – this take about 8-10 minutes – stirring it occasionally with a wooden spoon. Do not let this boil. Strain custard filling through a sieve into the pie crust shell. Smooth the top. Place in the refrigerator for 1 hour, then cover with plastic wrap and refrigerate for several hours. Serve with whipped cream on top (or, use Redi-Whip).